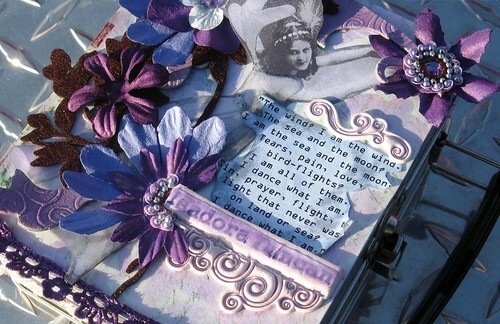 Here is my tribute to Isadora Duncan, the first lady of modern dance. I was a dancer for 17 years until my knees got the best of me and Isadora was always my inspiration. She was amazing, casting aside the norms of the day like corsets and stockings to dance in flimsy tunics and bare feet. She danced “with” not “to” the music. And, as is the story with many great icons, she met a tragic and untimely end. Partial to long flowing scarves, she was decapitated when one of them was caught in the spokes of her automobile. She personifies the feeling of dance for me, freedom at its fullest! Check out the link to the rest of the album for this project. Leslie, once again – BEAUTIFUL!!! Oh, this is sooooo beautiful Leslie!!! I just love it 🙂 If I had just 1/4 of your eye and talent, I would be a very happy woman!! I remember reading, many, many moons ago, about what a maverick Isadora was, staying true to her inner self and not caring what other peoples’ opinions were. What a great woman to get your inspiration from.